Previously, creating or modifying objects within a resource group that contained an environment was not possible because a lab user had only Reader access to that resource group. You can now set Contributor access rights on a resource group that contains your environment, so that you have the flexibility of modifying your environment objects. By giving your lab users Contributor access rights, you enable them to create, edit, start, or shut down resources, such as SQL servers or Azure Cosmos DB, in that resource group. By default, users have Reader access rights, and they can't add or modify resources in a resource group. 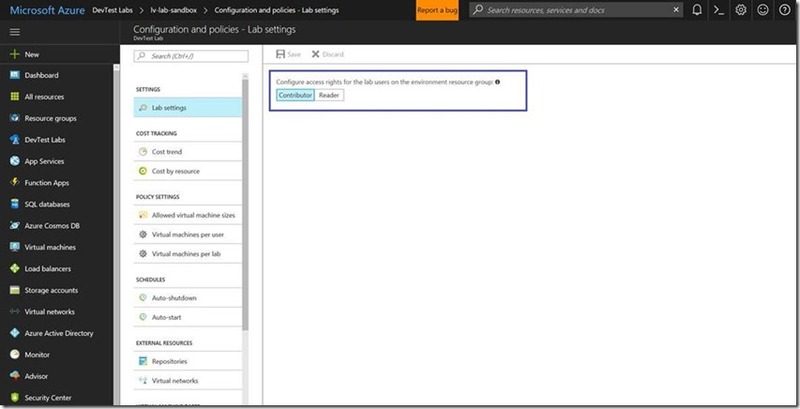 You change the access rights by using the Lab Settings blade in Configuration and Policies.